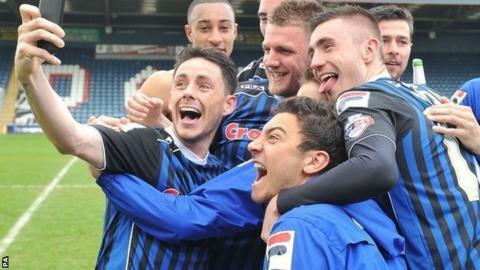 Rochdale secured promotion to League One with victory over Cheltenham. Peter Vincenti gave Dale an early lead when he side-footed home an Ian Henderson pass from 10 yards. The lead was doubled shortly after when Henderson slotted home from close range following good work from George Donnelly and Bastien Hery. The Robins rarely threatened and the hosts ran out comfortable victors to ensure a return to League One after two seasons in the fourth tier. "I'm pleased that we've given our place in League One back to the supporters. "I'm not one for really big celebrations. "I like to celebrate a little bit, I like to analyse and there's a great sense of feeling inside of emotional achievement." "I thought mobility was a massive problem for us today in terms of desire, recovery runs and our willingness to stay with people wasn't anywhere near what it should have been and it cost us two goals. "Joe Hanks got his chance today and showed that he's got ability. He's got a long way to go but we've given him a taste of it. "We've had a mediocre season and we want one like Rochdale have had. We've got to try and put a plan of action into place to make that happen." Match ends, Rochdale 2, Cheltenham Town 0. Second Half ends, Rochdale 2, Cheltenham Town 0. Craig Braham-Barrett (Cheltenham Town) wins a free kick on the left wing. Attempt missed. Byron Harrison (Cheltenham Town) header from the centre of the box misses to the right. Corner, Rochdale. Conceded by Troy Brown. Substitution, Cheltenham Town. Harry Williams replaces David Noble. Attempt missed. Craig Braham-Barrett (Cheltenham Town) right footed shot from the left side of the box misses to the right. Corner, Rochdale. Conceded by Scott Brown. Attempt saved. George Donnelly (Rochdale) right footed shot from the centre of the box is saved in the top centre of the goal. Attempt missed. Jermaine McGlashan (Cheltenham Town) right footed shot from outside the box is too high. Attempt missed. Joe Hanks (Cheltenham Town) right footed shot from outside the box misses to the left. Corner, Cheltenham Town. Conceded by Ian Henderson. Bastien Héry (Rochdale) wins a free kick in the attacking half. Corner, Cheltenham Town. Conceded by Josh Lillis. Attempt missed. George Donnelly (Rochdale) left footed shot from outside the box misses to the left. Attempt missed. Jamie Allen (Rochdale) header from the centre of the box misses to the right. Attempt missed. Rhys Bennett (Rochdale) left footed shot from outside the box misses to the right. Attempt blocked. Rhys Bennett (Rochdale) left footed shot from outside the box is blocked. Second Half begins Rochdale 2, Cheltenham Town 0. Substitution, Cheltenham Town. Joe Hanks replaces Sam Deering. First Half ends, Rochdale 2, Cheltenham Town 0. Attempt missed. Byron Harrison (Cheltenham Town) header from the centre of the box is too high. Attempt blocked. Peter Vincenti (Rochdale) header from the centre of the box is blocked. Attempt missed. Byron Harrison (Cheltenham Town) header from the left side of the six yard box misses to the left. Corner, Cheltenham Town. Conceded by Michael Rose. Corner, Cheltenham Town. Conceded by Oliver Lancashire.